You don’t need extreme measures and heavy equipment to tame Mother Nature. Northern Virginia is a beautiful place to live. The rolling hillsides of fields and farms, intermingled with large wooded areas are a gorgeous setting to build a home and enjoy nature. However, occupying such a naturalized setting often means that larger properties near Ashburn, Aldie, and Leesburg, VA can face problems with overgrowth of saplings, brush, and unwanted vegetation. 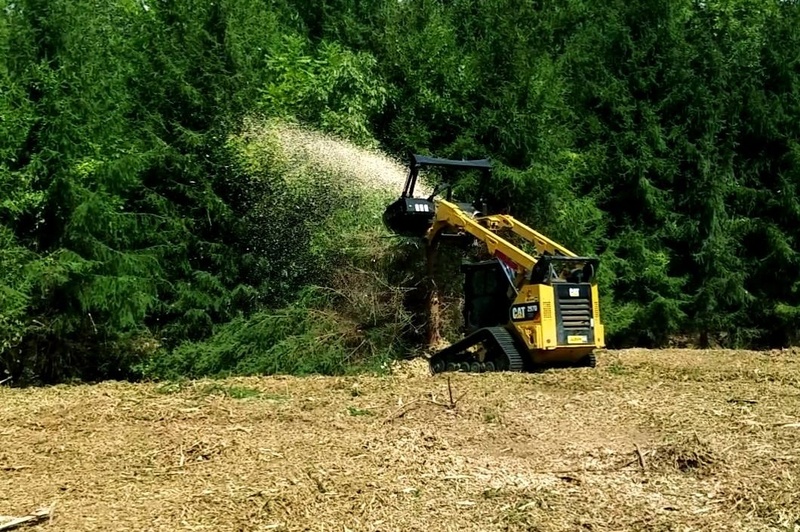 In order to keep these large areas tidy and provide the best functional use, homeowners often seek out the help of lot clearing companies, a bush hogging service, or those performing forestry mulching. Each service has its ideal application, even though the terms are used interchangeably by many people. In order to find the solution that will best clean up your property in Northern Virginia, and to match that operation with the right contractor, it’s important to first understand the true definitions of each of these services. If you have a large meadow area, or areas that are primarily tall grass and smaller, woody plants, bush hogging can quickly clean up these areas. A bush hog (or sometimes called a brush hog) is essentially a heavy-duty mower and can either be designed as a walk-behind unit or attached to the back of a tractor or the front of a skidsteer. The resulting debris remains on top of the surface of the cleared area, much like mowing clippings. 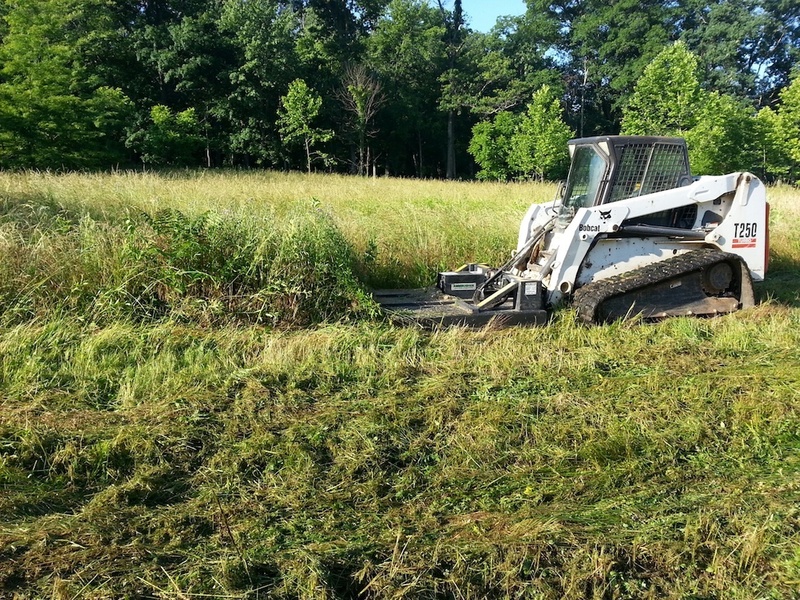 Rock Water Farm regularly performs bush hogging services to farms, equestrian facilities, commercial properties, banks along bodies of water, and large residential properties. Using heavy equipment such as bulldozers and other excavating implements, land clearing companies completely clear large areas of wooded areas, fields, and those with overgrown brush. The resulting debris can be quite extreme, and is removed entirely from the site in most cases. This type of service is not one that Rock Water Farm provides, but we do offer the following alternative that is a more suitable option in almost all settings. If you have large meadow areas, brush on banks of hills or ponds, or overgrowth in wooded areas, forestry mulching is an excellent choice for your Ashburn, Aldie, or Leesburg property. A forestry mulcher is a piece of equipment that can accomplish the same results of land clearing contractors, but without the need to use large, heavy equipment tearing up your property. And instead of removing hundreds or even thousands of tons of debris from your site, forestry mulching grinds this debris into small fragments, creating natural compost and mulch for the newly cleared area. Rock Water Farm is the only company in Northern Virginia that utilizes this amazing piece of equipment for forestry mulching. Other forestry mulching services do operate in our area, but drive long distances to service their clients. One of our team would be happy to visit your property in Ashburn, Aldie, Leesburg, or surrounding areas of Northern Virginia to evaluate your large residential or commercial site and provide you with a free estimate for forestry mulching or bush hogging. Feel free to contact us today for more information on how to clean-up your property and get better use out of it!